Check out the details on the new film from the the press release below. 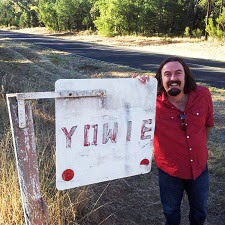 Bohem Films Rob Jacobs and Dane Millerd (Writer/ Director/ Producer of There's Something In The Pilliga) have teamed up with Sharry Flaherty and the team from Dark Water Productions to bring you the low‐fi mumblecore suspense thriller Are You Scared Yet? Inspired by films such as The Strangers and Funny Games, the film is currently in pre‐production and slated to be shot in the Nevada desert in early 2016. "The Dark Water team are currently finalising cast, investors and locations," said writer and co‐director of the film Dane Millerd (pictured). "They have been tremendous so far and we can't wait to work with them!" For Dark Water Productions, Sharry Flaherty, it is another posiiive step as the company continues to churn out quality content to their burgeoning international audience. Flaherty has just finished shooting the highly‐anticipated Khali the Killer with 2015 Emmy nominee Richard Cabral from End of Watch and Paranormal Activity: The Marked Ones). "When Black Wold Media (distributors of There's Something In The Pilliga/ Half Human) contacted us about this crazy script from Australia we jumped at it," she said. "Without giving too much away, we are currently talking to some top talent in the US about being involved in the film," said Millerd. "This film is going to blow people away!"